This is one of those simple sewing projects that can be completed at the last minute. But why wait? This is a cute and useful gift at a reasonable price, you can make up for all the girlfriends and women in your life. 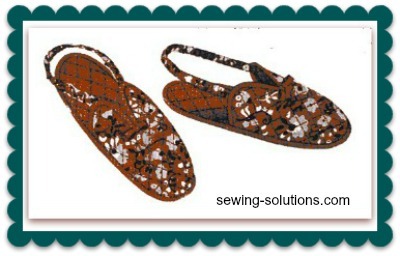 This pattern also goes great with the easy slippers you will find here by clicking on the picture. You could make a matching set in her favorite colors. And even personalize them with her initials. Making this set up will show her how much you care but taking the time to make these. The fabric required can vary and you can use scraps to save even more. But to give this give the edge surf Fabric.com and check out the wonderful choices they have in the colors you know she would love. Fabric.com also carries a great selection of trim to dress up these simple sewing projects. 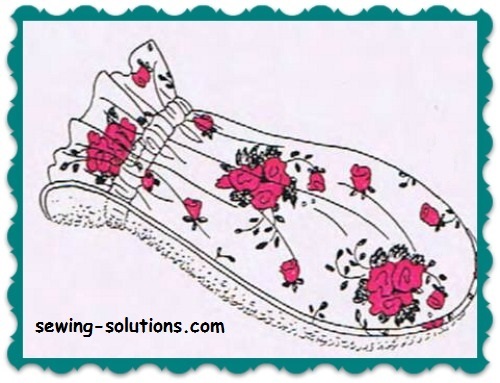 If you don't want to draw out this easy pattern you can always check out simplicity patterns for some really cute and simple sewing projects. 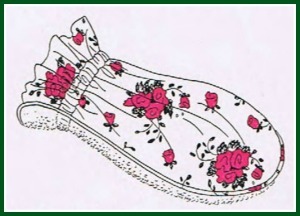 DIRECTIONS FOR CUTTING ... Cut from Terry Cloth, Oil Silk, and Chintz: Mitt - 1 piece of each fabric from Pattern No. I. Cut from Rayon Crepe: Facing-1 piece, 3" x- 12"; 2 Circles, each 6" in diameter. DIRECTIONS FOR MAKING. . . Mitt. Cut off 1 yd. of Bias Trim. To make cording, press this strip flat and fold in center. Insert cord in fold. Stitch as close to the cord as possible (use cording foot on machine). .Place Chintz and Terry Cloth right sides together and Oil Silk on top of Terry Cloth. Stitch all three together, using cording foot, and turn Terry Cloth and Chintz to right side. Place 2 circles of Rayon together. Stitch around edges, leaving a 2" opening. Turn to right side and overcast opening. Stitch Facing to unfinished edge of Mitt, right sides together (Fig. 2). Turn Facing to wrong side. Turn under raw edge of Facing, baste to Mitt. Stitch all around, leaving 1" open to insert elastic. Stitch 1/2" from edge (Fig. 3). Pull elastic through casing, sew ends together, hem opening. Note: To make patterns actual size, transfer diagrams as shown to large paper marked with 1 inch squares. One small square equals 1 inch square.